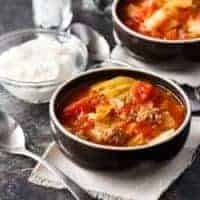 My Sausage and Cabbage Soup is hearty, comforting, low carb, and loaded with rich and savory flavors. It is the perfect soup to make on a cold winter day, where you want to warm up from the inside out. Italian sausage, diced tomatoes, cabbage, and a handful of spices come together for one excellent cabbage soup recipe. This soup reminds me a little of Cabbage Roll Soup minus the rice. I also used sausage instead of beef. You won’t even miss the rice, promise! This Sausage and Cabbage Soup makes a HUGE pot so you’ll have lots of leftovers unless you are feeding a large group of people. I warmed up a bowl in the microwave the next day, and it still tasted delicious. You might even say the flavors blended even more, so you had more dimensions of flavor in each bite. The real star of this soup is the cabbage. You start with 7 cups of green cabbage, which looks like a mountain of cabbage but trust me. As you cook your soup, that glorious cabbage gets wilted, and that is where the magic happens. Paired with the handful of seasonings and spices, it creates such a rich and vibrant soup. The Italian sausage makes it a blue ribbon cabbage soup recipe, hands down. The pairing of sausage and cabbage is something I can’t explain. These two ingredients are meant to go together. When you make my Sausage and Cabbage Soup, you will see what I mean. This soup couldn’t get much simpler to make! 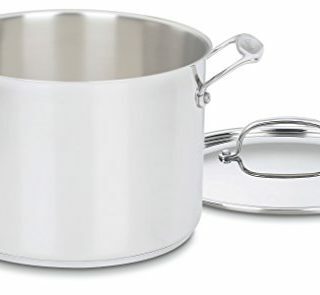 Start by grabbing a large pot and adding in all your chopped vegetables, stock, and seasonings. Bring all the ingredients to a boil and then cover and reduce the heat to medium-low. Let the soup simmer for 30 minutes to one hour to blend the flavors together. Once ready to serve just remove the bay leaf and then dish it up. Sugar | By adding in a little sugar to your soup, it will help remove the tinny taste from the canned tomatoes. If you are trying to avoid sugar, then feel free to skip. I find sugar helps give the soup a fresher taste. Italian Sausage | I find buying sausage that is in casings offers a bit more quality taste. I remove all the casings and cook up my sausage. Make sure to drain off any of the excess grease. Cabbage | You will find buying a head of cabbage is very affordable, and it takes just a few minutes to chop up. If you are in a pinch of time or can’t find a head, you can buy pre-cut cabbage that you can toss in your soup. 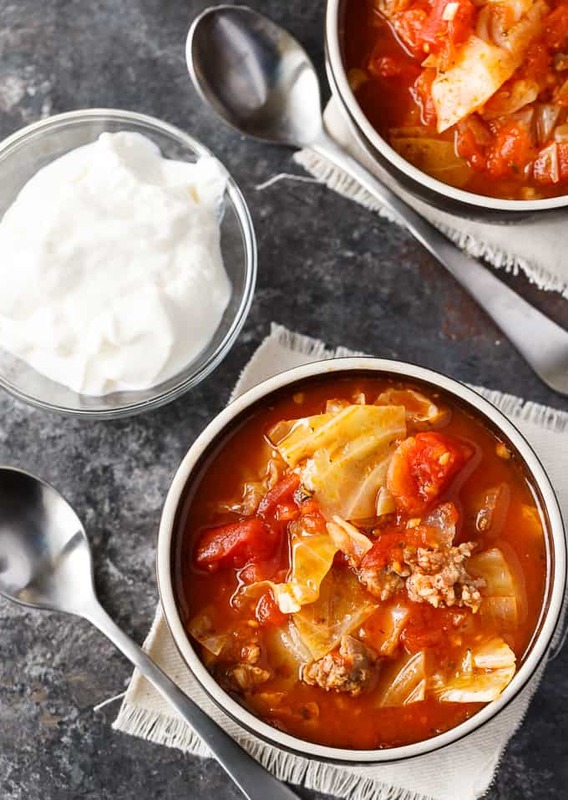 Also, some great toppers for this Sausage and Cabbage Soup recipe are adding a dollop of sour cream or even cheddar cheese. It adds a whole new element of flavor. You might also enjoy this Sweet and Sour Cabbage or Cabbage Roll Casserole. Make sure that you store your cabbage soup properly in the fridge, and by doing that it can last up to 3-4 days. After that, you will want to toss out any leftovers. Yes, you can freeze your leftover soup! Since this recipe makes a ton, I do recommend tossing some in the freezer for meals down the line. 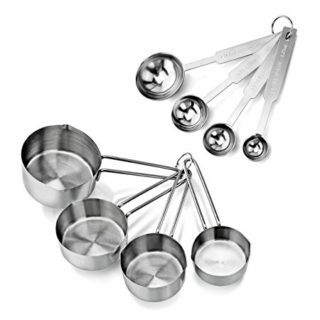 Once your soup is cooked, allow it to cool down a bit, and then pour into containers. Store in an air-tight container for up to three months. Or feel free to store your soup in a freezer bag, just make sure to try to get all the air out you can. 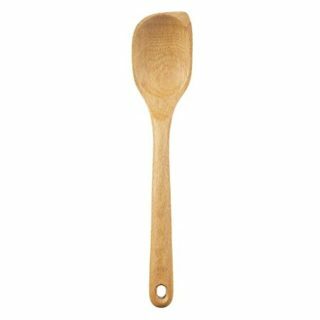 I will freeze individual servings of this soup so that I can pull out a container here and there for a quick lunch. It is great this way, and so easy. To reheat just allow to thaw overnight in your fridge, and then warm it up on the stovetop or in the microwave. As you can see this recipe is quick to get going on the stove, and then you just wait and allow the soup to blend and break down. Spoon up and enjoy a comforting bowl of sausage and cabbage soup. We make this all the time; it is such a nice change from the classic potato or chili recipe we get in a rut making. Have you tried Sausage and Cabbage Soup before? This low carb soup is easy to make and tastes delish! It’s comfort food perfect for a cold winter’s day. In large pot, stir together all ingredients. Bring to a boil. Cover and reduce heat to medium-low and simmer for 30 minutes to 1 hour. Remove bay leaf before serving. A hearty and most satisfying soup if ever there was one. I love cabbage in the wintertime as a meal. 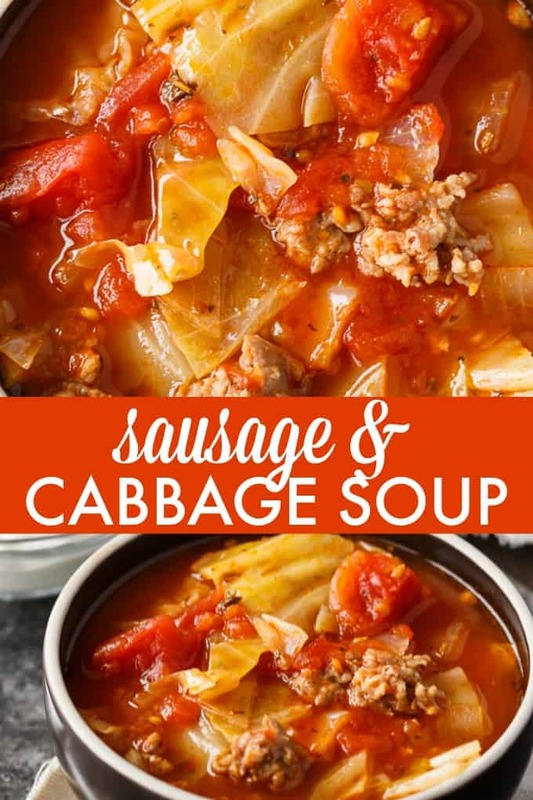 I really love a Cabbage and Sausage Soup, so comforting in the cold winter! Happy to see you here at Full Plate Thursday and thanks so much for sharing with us. Great soup for cold weather. Thanks for sharing this at the Inspiration Spotlight party Looks yummy. Pinned & sharing. This looks healthy and filling. Also, soup is always good when it is so cold outside! I love cabbage meals, so this recipe is right up my alley. It’s the perfect comfort food for winter. Thanks Stacie! Great idea for a cold day. We don’t eat cabbage soup often but this looks so delicious and hearty. I love the little sugar tip… I’ll definitely be putting it to use! This looks so yummy! Thank you for the recipe. great recipe. love the tip about adding sugar to erase the metallic taste that comes from the tomatoes, never seen than one before, also happy not to have the rice, love the cabbage paired with the sausage, thank you for this recipe! I love this recipe! Thanks so much for sharing, it’s becoming one of my favorite soups of all time! I add a splash of A-1 and a little celery salt to mine. Oh cool! I’m in Pembroke, Ontario.